ARMONK, NY	- 02 Nov 2006: IBM (NYSE: IBM) today introduced the industry's first systems management portfolio allowing companies to discover, monitor and manage diverse virtual and physical computing resources from a common portal, including IBM and non-IBM systems and software. The IBM Systems Director family allows clients to better manage all of their virtual and physical resources in the data center, working with Tivoli offerings to provide complete cross-enterprise service management. Part of IBM's Systems Director family, the new IBM Virtualization Manager software offering significantly reduces the number of management tools needed to support multiple types of servers. The Virtualization Manager dashboard operates in a web-based user interface and allows businesses to manage technology resources like they would a financial portfolio, moving computing workloads to key areas of the data center that will drive productivity, identify problems in the infrastructure, grow existing workloads, and add or delete computing resources. As the first technology in the industry to work across multiple major virtualization platforms, the IBM Virtualization Manager includes initial support for VMware, Microsoft Virtual Server, Xen and POWER-based virtualization offerings. Clients can also leverage the capabilities of VMware's VirtualCenter by integrating it into IBM Director to provide a single point of management. "The cost of administering increasingly complex systems is growing faster than the cost of new hardware -- making system management the next frontier of virtualization," said Rich Lechner, vice president, virtualization at IBM. "As customers deploy more virtualization and partitioning technology from multiple vendors, it's creating a need for more simplified management of these diverse virtualized infrastructures. Building on years of experience with mainframe virtualization technologies and cross-enterprise systems management, IBM is helping clients effectively manage physical and virtual resources together." As clients virtualize their IT environments, the management of those systems becomes more complex. While clients may no longer have 200 physical computers to manage, they instead have to manage 200 diverse virtual computers that are associated with hundreds of physical servers. Part of a multi-million dollar investment in virtualization management, IBM Virtualization Manager was developed by a worldwide team in Israel, Mexico, and the United States. The developers helped to create a product that graphically shows and manages the relationships between virtual and physical systems. This unique view of the resource topology helps clients to manage virtual server environments. Clients taking advantage of IBM Virtualization Manager technology include Forschungszentrum Karlsruhe, one of the largest scientific and engineering research organizations in Europe. The company is using the new Virtualization Manager technology to help manage a heterogeneous grid computer infrastructure of about 2,000 computers. Part of the grid computer uses IBM BladeCenter Systems with virtualization software from Xen and VMware. "The Virtualization Manager extension to IBM Director provides a unique approach to systems management allowing us to more easily manage our virtual Xen and VMware environments on IBM BladeCenter in conjunction with our physical systems," said Dr. Marcel Kunze, grid computing department leader, Institute for Scientific Computing. "By 2009, we anticipate quadrupling the number of servers we need to manage, so the need for a common management toolset is critical. This IBM Director extension provides a management interface to help simplify our virtual and physical systems." The Systems Director family also provides a seamless integration to full cross-enterprise service management capabilities using Tivoli software solutions. These Tivoli software solutions provide a service management platform that enables process automation and integration to achieve the operational efficiencies and effectiveness that our customers demand for their IT environments. The Systems Director family is a key foundation to IBM's on demand data center, helping clients to further simplify and automate management of computer systems. 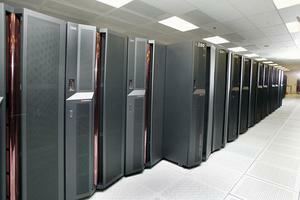 The company has the longest history of data center experience. IBM is now helping clients create a next-generation IT architecture to simplify diverse global operations by integrating a set of technologies and service management best practices. Clients of IBM System x, BladeCenter, System p, System i or System z can download IBM Virtualization Manager. The software runs on Windows and Linux for System x and BladeCenter. The software will support VMware, Xen, Microsoft Virtual Server, and System p and i virtualization. For more information, visit http://www.ibm.com/virtualization. The following are either trademarks or registered of International Business Machines Corporation in the United States or other countries or both: IBM, Tivoli, BladeCenter, System x, System i and System p. All others are trademarks or registered trademarks of their respective companies. Statements concerning IBM's future development plans and schedules are made for planning purposes only, and are subject to change or withdrawal without notice.